We bring forth for our clients superior quality Leather Articles. While manufacturing these Leather Articles, we take extra care of quality so our clients get best product. The support of innovative craftsmen has resulted into the development of leather articles with intricate and latest design. We believe in using only the Genuine Leather materials available on the market to create each distinctive article. 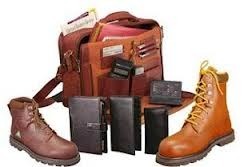 Our leather goods are superior both in quality and workmanship so that they may be treasured for many years. Vision Knight Exporters Pvt. Ltd.